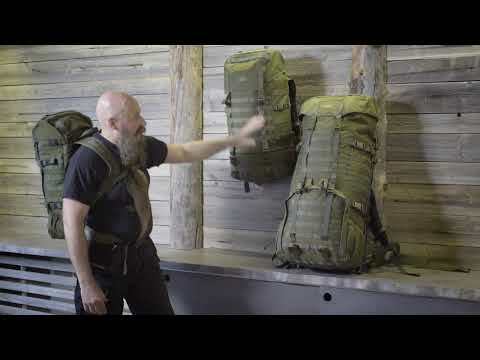 The daypack originally designed for the Finnish Border Guard and also known as the Kevyt Rajapartio is compact, simple and very versatile. Due to its slim shape, the backpack will not be in the way even in cramped spaces and is ideal for skiing and hunting. In its size category, the Kevyt Rajapartio is an unusually sturdy backpack to carry. The internal support frame reinforced with aluminium holds the backpack firmly in shape even with a heavy load. With the compression straps of the bag, even a pack that is not full can be tightened so that it sits firmly and does not jiggle around. The bag (dimensions approximately 50 x 25 x 10–20 cm) is closed by tightening the drawstring opening which is secured with a waterproof protective collar which enables overpacking as well. The opening is covered with a flap which hugs the top of the backpack and is secured with straps. The generous length of the straps provides a lot of space under the flap for overpacking. The contents of the top compartment can be accessed quickly also from the right side through a vertical zipper that runs along the full height of the backpack. There is a holder for a Thermos flask inside the bag so that you can always find it from where it should be. The flap of the bag has a flat zippered pocket for small items (dimensions approximately 20 x 20 cm). It is also possible to fasten items that would not otherwise fit in the backpack behind the compression straps of the bag. The bottom of the backpack has four attachment loops for detachable straps. Tying to the bottom is an excellent carrying method for rolled sleeping mats, for example. There are attachment loops on both sides of the hip belt for dangling small items. The wide, anatomically shaped, sturdy shoulder straps and the well-padded hip belt make for supported and comfortable carrying. The buckle of the hip belt can be undone quickly with one hand, which is a very valuable feature in a possible emergency situation. The buckled chest strap provides extra comfort and support for carrying. With the carrying handle on the top, the backpack can be carried easily by hand as well. The back has been reinforced with a highly durable frame made of plastic sheet to which two vertical aluminium rods have been attached with rivets. Because of this lightweight frame, the backpack stays upright and is comfortable to carry even with a load that is a bit heavier. The support frame can also be removed from the backpack, if desired. The generously sized and sturdy padding pillows against the back are a rarity in a backpack of this size category and make the Kevyt Rajapartio a surprisingly comfortable small backpack to carry. External dimensions: height 50 cm, width 25 cm, depth 20 cm. Materials: 1000D Cordura, metal buckles and 8 mm coil zippers. Jääkäri S is the Jääkäri product line’s smaller daypack.